Unexploded Cow is a money game in which the players are trying to collect enough points to win the Pot. On every turn you will buy Cows and pay for special effects by putting money into the Pot, then try to discover bombs with your own Cows in an effort to take money out of the Pot. All along, you will be earning points from the French as you liberate town after town from the terrors of unexploded bombs, and the player who scores the most points gets whatever's left in the Pot. 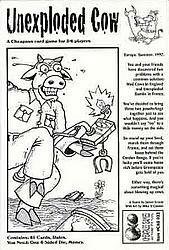 Unexploded Cow is best played as a series of short games, each of which takes about half an hour. The game is quite simple and very chaotic, and we think you'll have a blast.